A short while ago I tried to make a flat pattern from a 3D design that I had previously sculpted out of plasticine. 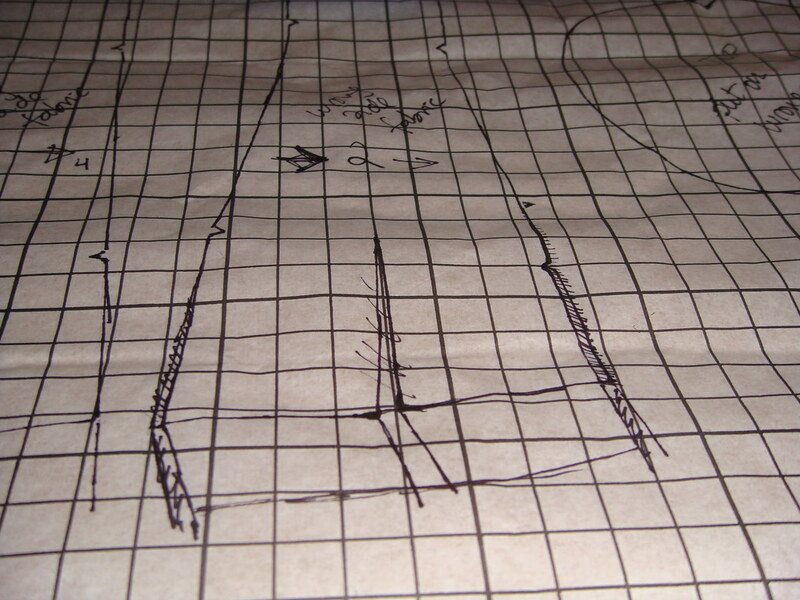 It turned out pretty good although the resulting pattern had many darts (in order for it to stay flat). If you didn’t read about that process you can do it now by following this link. This time I’ve tried to see what would happen if I eliminated the darts and compensated by cutting the pattern pieces on the bias. First I’ve traced the pattern pieces onto another paper and reduced the width on the sides to compensate for the darts that I’ve eliminated. 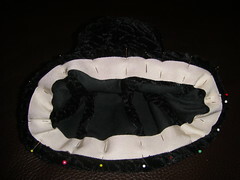 Only one dart remains, on the back, that will help to do last minute adjustments to the right headsize size. I’ve also modified the pattern so the hat has a nice tilt to the right by trimming the bottom on that side. Once I traced the pattern onto the fabric and cut the fabric, I machine sewed the side panels together and trimmed the seam allowances. 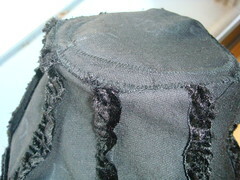 Finally I sewed the top piece on. 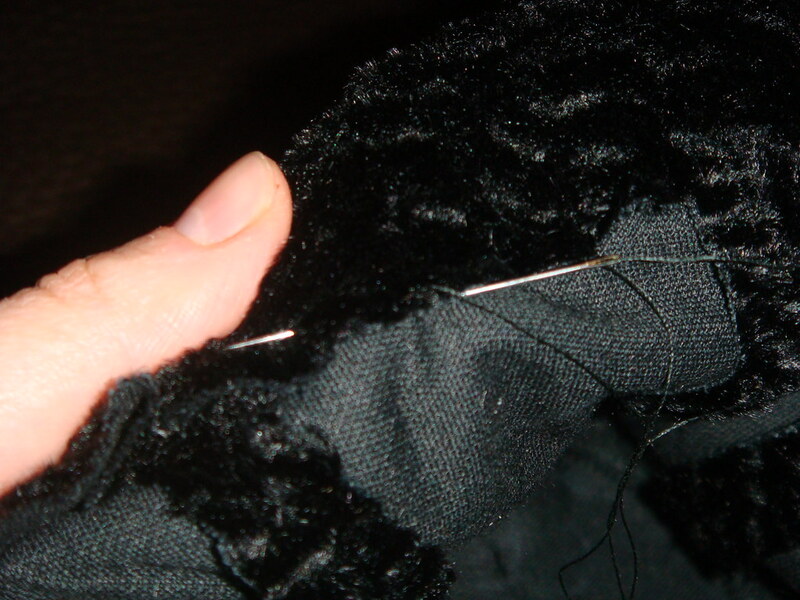 The result was a bit flimsy and the top piece did not stay nice and flat, so I decided to zig-zag nylon wire to the top edge using the beading foot of the sewing machine. 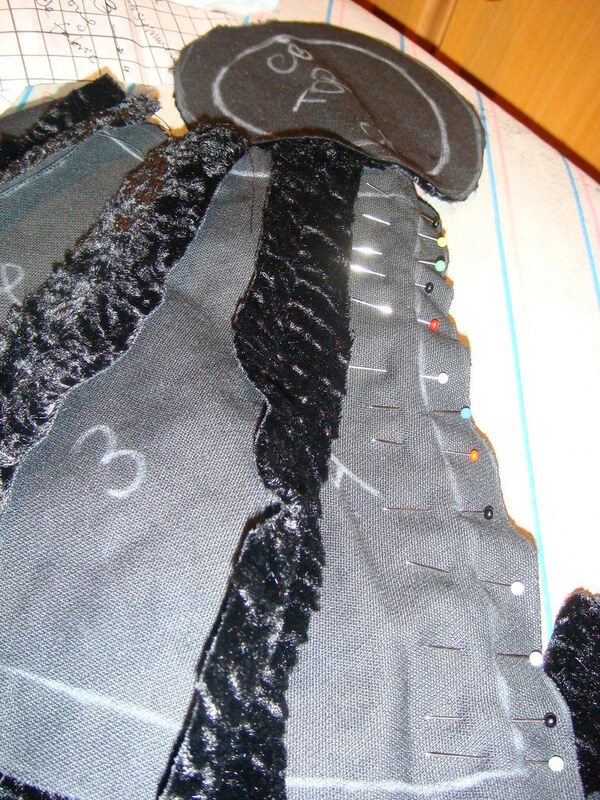 Finally I zigzagged the seam allowance so that it all stayed in place. That was a bad idea because the zig-zag was visible on the outside. Fortunately brushing the pile with a wire brush helped to hide it, but next time I will do that bit by hand. The hat is finished on the inside by slipstitching the hem first and a grosgrain ribbon onto it (which also helps to adjust the headsize). For the moment I’m leaving it without lining because it looks pretty neat as it is. que chulo! el broche le da un punto muy guapo. I love your blog. Really great. 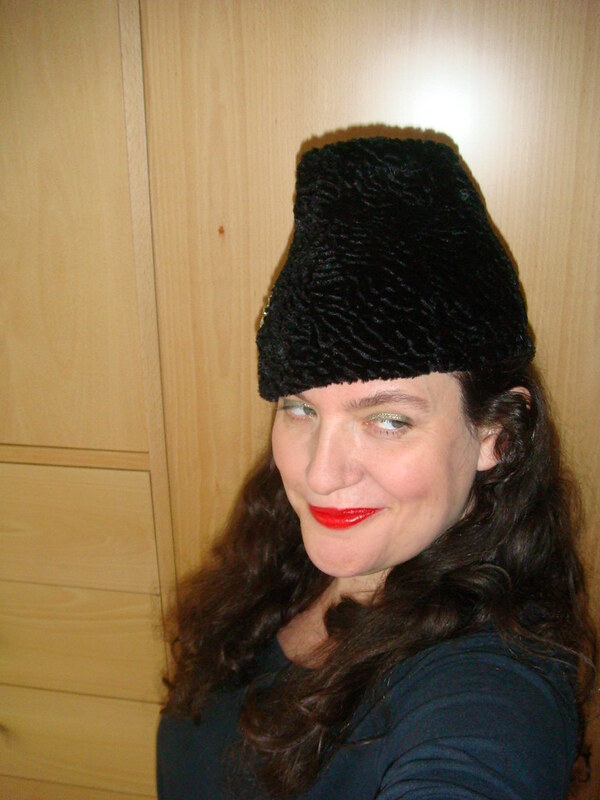 And the hats are terrific—right up my alley. Seems we have a similar love of shape. You asked in your posting on my blog how the hat is kept on. 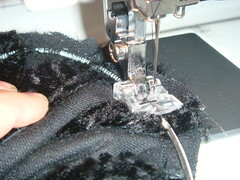 I like to use black elastic, though it’s been difficult getting elastic that’s good enough in quality. I hate combs and I find the elastic to be very comfortable. Em que parte de Espanhã é que você está? Thank you Dirk, I see from your website that you guys also do some amazing work! Denishé, thank you for your encouraging comment. How come you speak (write more like it) Portuguese? I must confess that my knowledge of that language is very basic despite the fact that Portugal is our neighbour. You ask where in Spain I am, well, I’m in Barcelona, a beautiful city. Beautiful!! The shape reminds me of a Lilly Dache I saw somewhere. You look terrific in it too with those red lips! That’s absolutely darling! And I love Persian lamb. I have a fabulous muff made out of it. It’s fabulous and the brooch really makes it even more so. 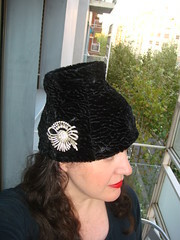 What an adventure in learning and the hat turned out smashing too! I hope you will let us know what some of the people say who see you in it in real life. I would be sprinting across the room to find out where you got it if I saw you in real life. Classy…and great use of the brooch too. Black hats and brooches are just made for one another. PS: Are you gonna sell the pattern? I want one…. 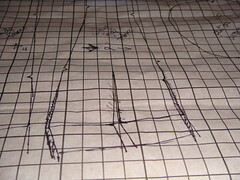 For the moment I have no plans of selling the pattern, but I will let you know if that changes! Your hat is lovely. 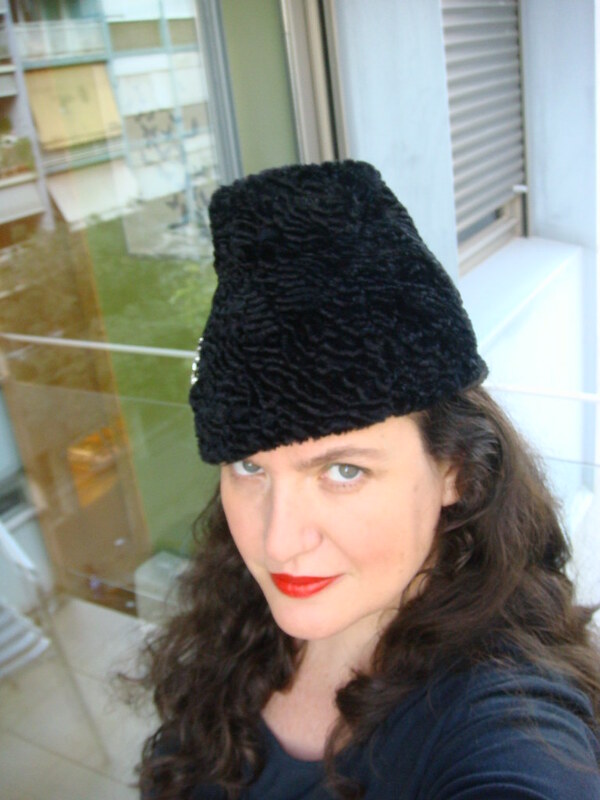 I am a millinery instructor here in the United States. Go to my website on eBay “xxxxxdeletedxxxxx”; click on this and you will see the text book that I teach from. This book will really help you with learning millinery on a professional level. Keep checking my site because I have a video which will be available shortly. 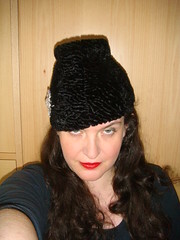 How kind of you to say that my hat is lovely. I noticed, that at the time of your comment you are selling this book on eBay for 45 USD each when it can be bought directly from the Publisher (Madhatter Press) for only 25 USD each. As a matter of fact, if a group of students (or say, a distributor like you) decided to buy 10 books at a time the price would drop to 15 USD each. Perhaps it’s just an honest mistake and 45 dollars was not the price you meant to set, that I cannot know. I would love to see your work, which I’m sure will be on a professional level. Please let us know where we can admire it.